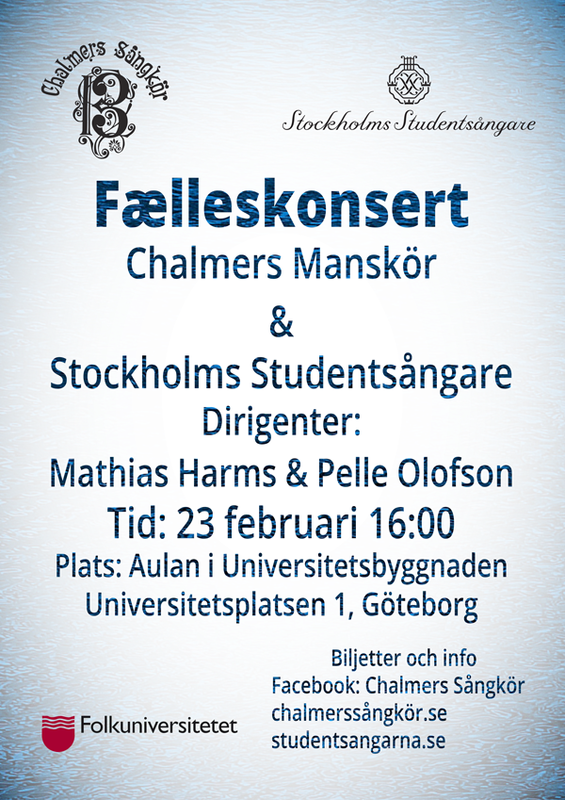 On February 23rd, the Stockholm Academic Male Chorus visits Gothenburg and together with the Chalmers Men's Choir a concert will be arranged. Take the opportunity to listen to two men choirs who offer high quality music in the Assembly Hall in Gothenburg University's main building at Vasaplatsen. Among other things, you will hear "Ett Bondbröllop" by A. Söderman, "The Little Green Lane" by S.E. Lovatt, "Now the Powers of Heaven" by A. Sheremetev and other songs from the Nordic countries. To pay in advance, swish the total sum to 1230833087. "CMK-SSSF-konsert FÖRKÖP V: S: "
You write the number of Ordinary tickets after O, and the number of Student tickets after S.
When arriving at the entrance of the concert you primarily give the name of the person who paid for the tickets, or you can give the phone number that the payment was sent from.